山顶洞最新测年数据-下限至35.1~33.5 ka - 文化考古 Cultural Archaeology - 蓝海人类学在线 Ryan WEI's Forum of Anthropology - Powered by Discuz! 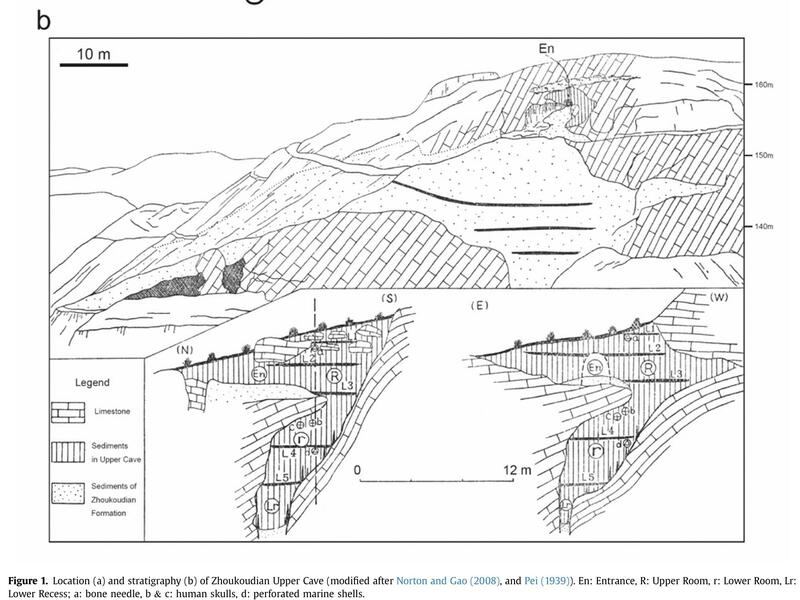 Due to the presence of multiple partial modern human skeletons thought to have been interred along with a diversity of evidence of symbolic behavior, Zhoukoudian Upper Cave (ZKD UC; formally “Choukoutien”) from northern China has long been a critical site for understanding Late Quaternary human evolution and particularly the role eastern Asia played. Unfortunately, uncertainty regarding ZKD UC's chronology has long hindered determination of its importance in the debate over modern human origins. This situation has been particularly problematic because dates from the primary archaeological layers of ZKD UC have ranged from the Late Pleistocene to the Early Holocene (&#8764;34–10 ka), with clearly different implications depending on which age is used. Here, we present a new set of accelerator mass spectrometry radiocarbon dating results from ZKD UC. Based on this new set of dates and further re-evaluations of the previous dating analyses, archaeological materials, published excavation reports and stratigraphy, we conclude that the ZKD UC archaeological layers minimally date to 35.1–33.5 ka. Given the similarities between the human fossils and archaeology between ZKD UC and western Eurasia, it is likely that the ZKD UC human foragers were part of dispersal events across northern Eurasia toward Siberia and eventually reaching into northern China. In this study, we presented a series of new AMS dates pretreated by ultrafiltration from ZKD UC. 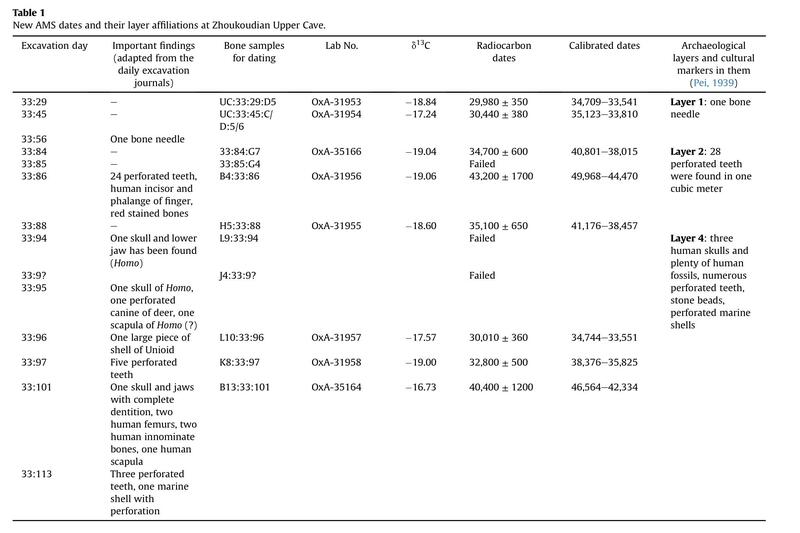 Although a high-resolution chronology of different “cultural layers” could not be accomplished, the new set of AMS dates indicates clearly that ZKD UC minimally dates to 35.1-33.5 ka and not the Early Holocene or even the Last Glacial Maximum. Dates from an area with concentrated ornaments in Layer 4 shows the important findings including the burial and human fossils from this layer could date as early as 38.3-35.8 ka. In addition, given the similarities between the human fossils and archaeology between ZKD UC and western and northern Eurasia, in all likelihood, the ZKD UC modern humans were part of the same dispersal event out of Africa and into Eurasia that began after 50 ka. This is not the same as arguing that there was a single dispersal event out of Africa after 60 ka (e.g., Mellars, 2006; Klein, 2008; Kaifu et al., 2015), but rather that it was likely one of several dispersal events that began after the advent of the Late Pleistocene, one of which occurred after 50 ka (Bae et al., 2017a,b). GMT+8, 2019-4-26 18:06 , Processed in 0.285739 second(s), 18 queries .